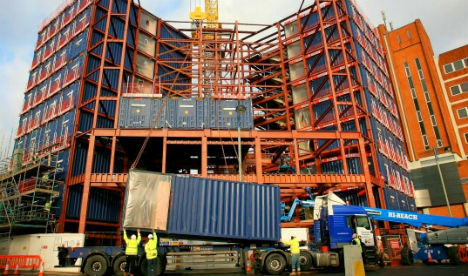 Portable, durable, stackable and readily available all over the world, shipping containers are the ideal building blocks for smart structures of practically every variety. Some require just a little bit of renovation to transform into tiny houses or mobile offices, and others are barely recognizable. Often left with their exteriors as-is to pay tribute to their industrial origins, shipping containers can be used to form exterior walls and integrated into other types of building materials. 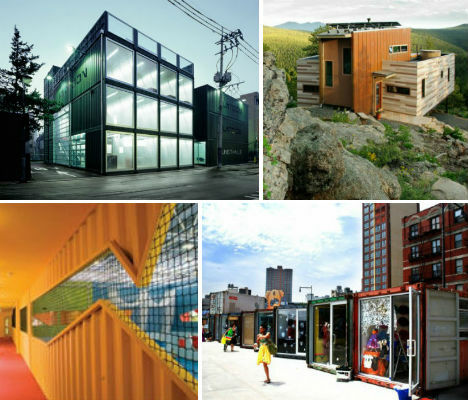 Here are 23 examples of shipping container architecture in the form of homes, schools, offices, retail stores, hotels and restaurants. Dark and tightly enclosed, shipping containers may not seem like a fitting material for a comfortable home, but architects and home builders are transforming them in a variety of surprising ways. 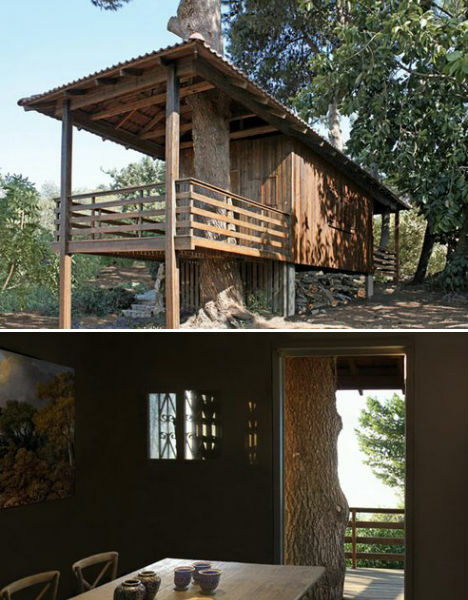 Take Golany Architects’ Two-Tree House, in which a shipping container was integrated into a design that accommodates two large existing Jerusalem pines on the building site. Aside from the shape, you’d never guess that the basis of the home is a shipping crate, especially since it has been covered in warm and welcoming timber cladding. Five bright yellow steel shipping containers were combined into a large and light-filled home in Santiago, Chile. Project ARQtainer is an earthquake-resistant, low-cost home that makes use of the strength, durability, stackability, modular form and ready availability of shipping containers. 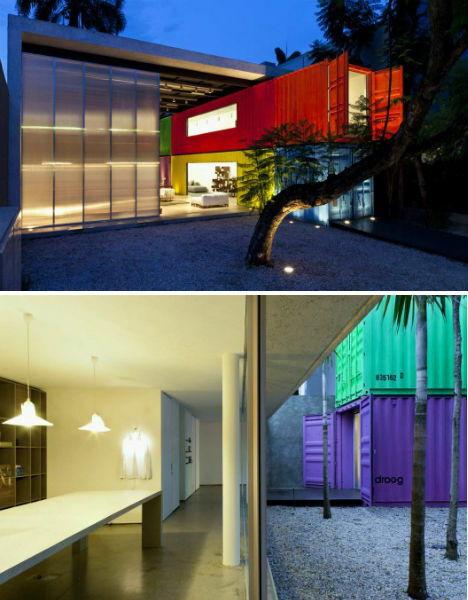 Another shipping container home in Sao Paulo, Brazil by Marcio Kogan employs the stackability to fit a spacious home into a small plot of land, painting each one a bright shade. 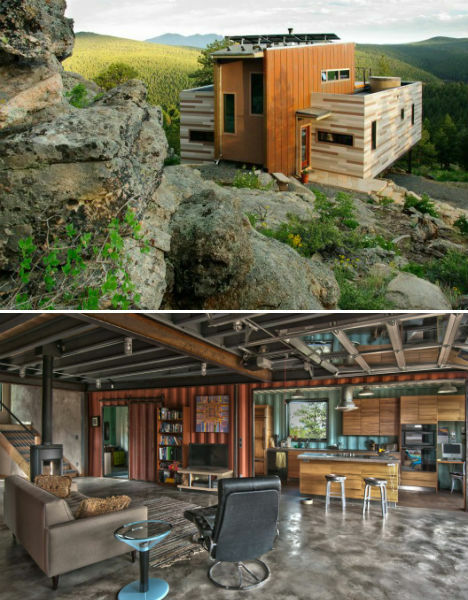 And in Nederland, Colorado, an unusual home by Studio H:T places two shipping containers on either side of a taller volume for 1,517 total square feet and an exterior that blends nicely into the landscape. With cramped budgets, rapidly deteriorating structures and growing populations but little space to expand, many schools across the globe turn to low-cost, portable structures. But the prefabricated classrooms typically used by school systems are often lacking in the design department. 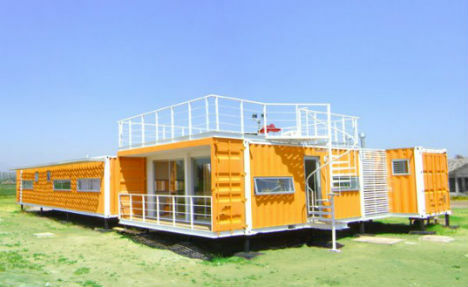 Shipping containers offer an ideal alternative. 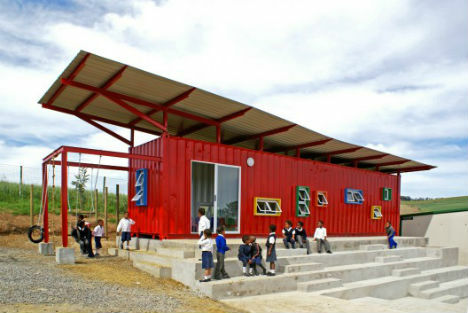 For example, the Vissershok Primary School in South Africa has a container classroom that hosts 25 students, adding a secondary roof for cooling and integrating an attached play area. 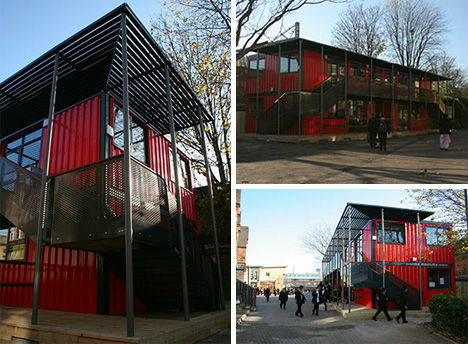 The Morpeth School in London is very similar, but with multiple stacked containers. 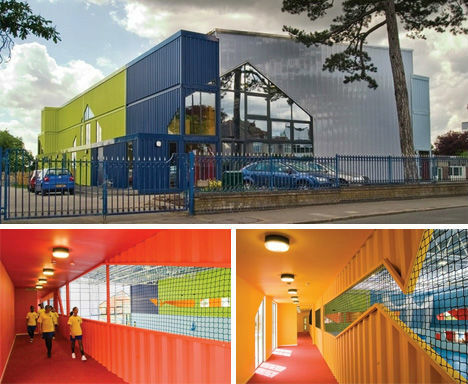 Three walls of stacked shipping containers come together with a fourth translucent polycarbonate wall to create an eye-catching, bright and low-cost sports hall for the students of Dunraven secondary school in London. Interior cutaways on the containers turn them into balconies, while exterior cutaways let in sunshine. 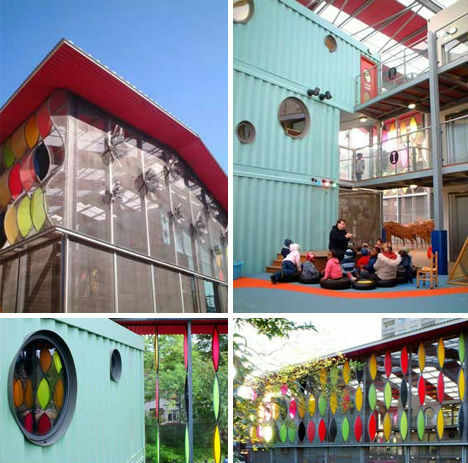 At the Fawood Children’s Center in London, shipping containers are connected with walkways and stairs for a large complex with a nursery, adult education center and offices. 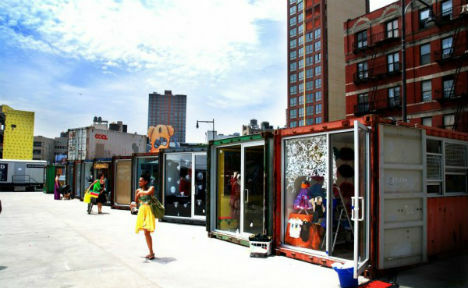 Whether mobile or stationary, shipping containers are also a great starting point for retail stores small and large. 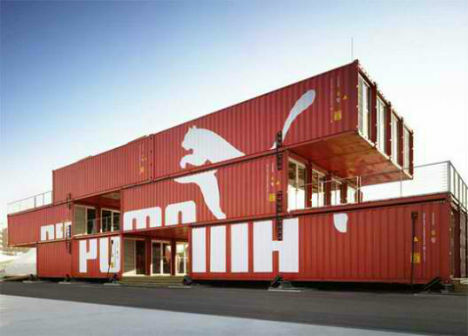 PUMA City is an excellent example of creative deployment of these crates. 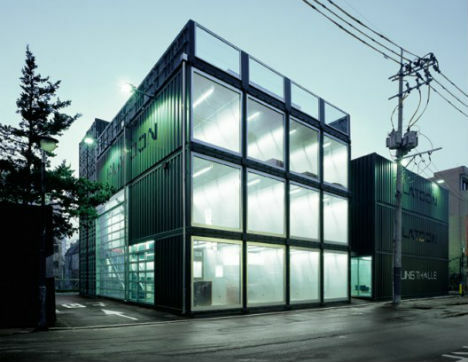 Architecture office LOT-EK stacked 24 containers to create a 3-story store with a bar/lounge area and 2 decks – and best of all, it’s easily disassembled so the store can travel around the world. Brooklyn’s DeKalb Market is made from 22 salvaged shipping containers, bringing local entrepreneurs together into an outdoor market with shops, restaurants and cafes. Most of the containers have been left in their original state on the outside, paying tribute to the history of the commercial port location. Shipping containers are also a smart way to bring small markets into urban food deserts, where convenience stores are often the only source of food. 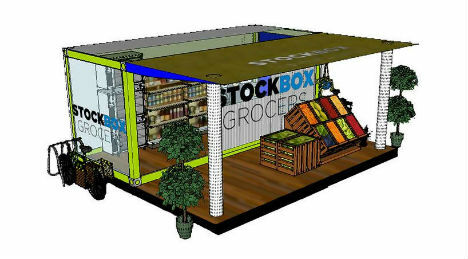 Stockbox offers essential grocery items and fresh produce, and can easily be set up in the parking lot of an existing business. 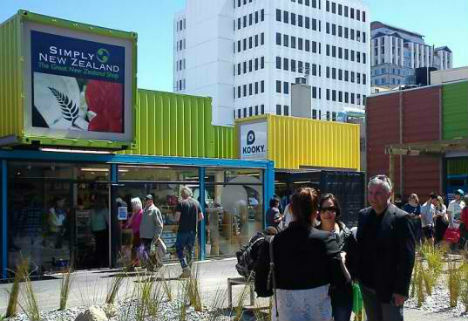 In New Zealand, shipping containers enabled rapid construction of a mall after many structures were destroyed in a devastating earthquake. The pedestrian shopping mall consists of stacked, brightly colored crates holding 27 stores. 16 recycled shipping containers create individual private offices within a large white space in the Geneva headquarters of design collective group8. 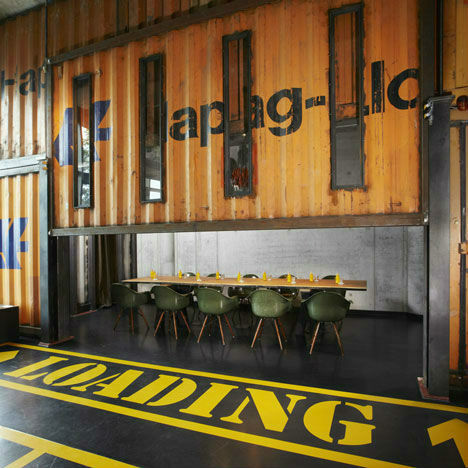 The rustic, industrial nature of the crates contrasts with their glossy modern surroundings. For PLATOON KUNSTHALLE in South Korea, 28 crates were stacked to create the exterior walls of a large communicate platform for subcultural creative fields, and many of the crates were given an entirely transparent wall to combat the dark, enclosed environment. 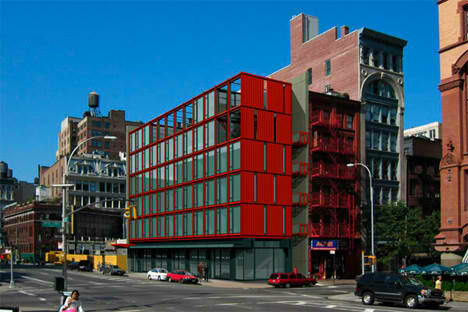 Bright red shipping containers contrast with brick historical buildings on Lafayette Street in New York City. Designed by Urban Space Management, this concept was proposed to add office space to the block, but it’s not clear whether it will ever actually be built. 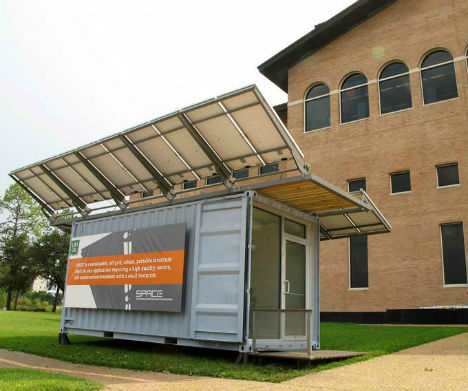 On a smaller scale, Houston-based architecture practice Metalab demonstrates how individual shipping containers can serve as mobile, off-grid offices. ‘SPACE’ (solar powered adaptive containers for everyone) is a prototypical adaptation featuring a fold-out solar rack system with 20 solar panels on the roof. 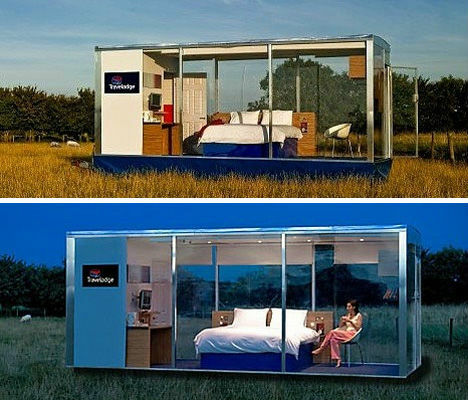 While Travelodge’s ‘Travelpod’ hotel room concept wasn’t actually made from a recycled shipping container, it certainly could be – and promotes some intriguing ideas for rentable traveling spaces that can be carried on trucks and ships or placed on location at festivals. But the hotel chain did employ shipping crates for its hotel in Uxbridge, England. The completed design is made from 86 prefabricated shipping crates, which were retrofitted into bedrooms and bolted into a steel frame. This means that when the hotel needs to be remodeled, switching out the rooms will be fast and easy. 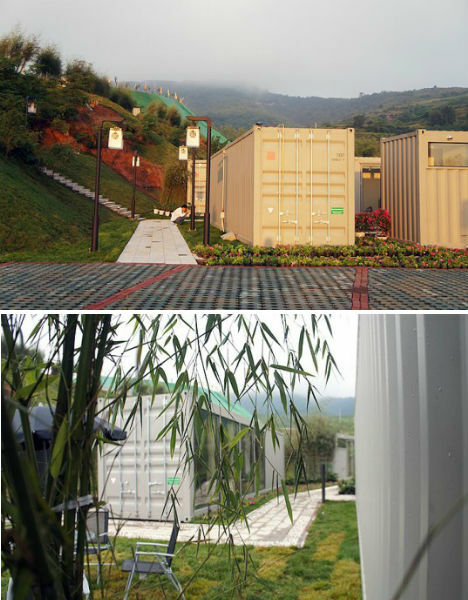 Set to open in August 2012, China’s five-star Xiang Xiang Xiang Pray House Hotel is made entirely from shipping containers. It doesn’t look like much on the outside, but each of the individual containers has been fitted with a luxurious blend of traditional Chinese and modern decor. 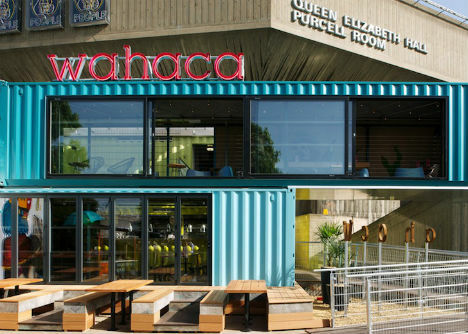 8 stacked shipping crates in relaxing pastel colors draw hungry passersby into the new Wahaca mexican restaurant at the Southbank Center in London. The crates create a two-story structure with a central glass atrium and a cantilevered top story that provides a view of the Thames River. 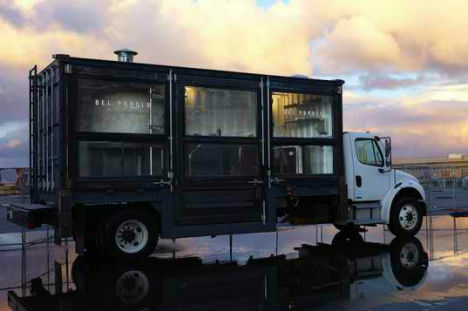 Another restaurant, Del Popolo, uses the compact portability of a shipping container to take its pizza on the go. The traveling restaurant has a glass wall so diners can watch as their pizza emerges with cheese bubbling from a traditional 8,000-pound wood-fired oven. 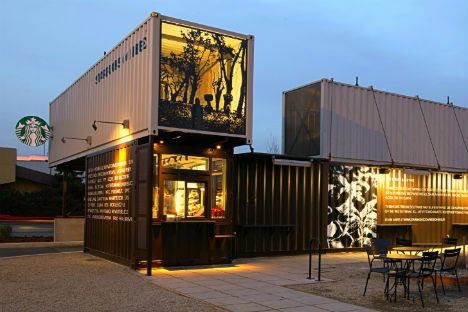 Even larger chains like Starbucks are taking advantage of the shipping container craze. The coffee giant just opened a new location outside of Seattle that’s made from four crates. The small size may disappoint coffeehouse loungers armed with laptops, however: it’s walk-up or drive-through only.